Elegance in its purest form. A room is just a room. Until Ameno makes an entrance. 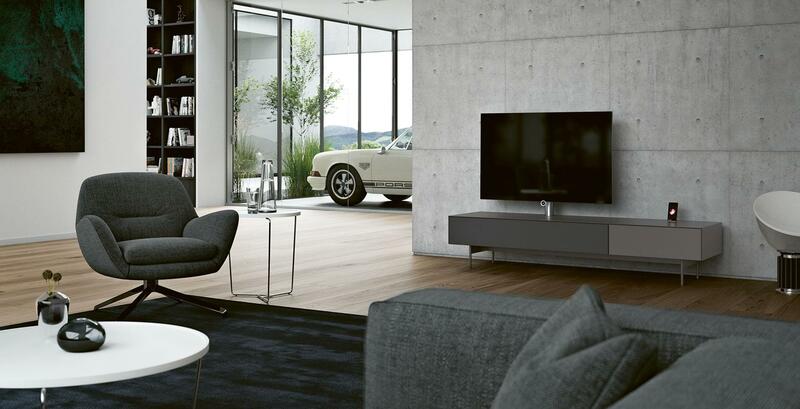 With its pioneering technology, diverse functions and endless configurations, this exclusive collection will give your home a unique atmosphere. It’s minimalistic design paired with maximum enjoyment – setting a new benchmark in beautiful living. Furniture surfaces can be tailored to personal tastes and preferences, in line with current and future colour and material trends. Two and half metres of audacious audio. With Ameno, you can choose between three superlative sound systems. Fire without the smoke. Wouldn’t it be nice to be able to have instant cosiness at the flick of switch? For soundbars from Sonos, Samsung, Bose, Sony etc. Ameno catches the eye and bewitches with its beauty. But the focus is on you and your preferences. Especially when it comes to your favourite music and movie soundtracks. A made-to-measure Spectral sound system gives you a powerful and perfect audio experience. Or perhaps you will opt for a Sonos Playbar. Or for solution that has no integrated sound system whatsoever – giving you even more storage space. Sounds good, right? Plug in, chill out. Like most Spectral furniture, Ameno has the Smart Dock feature, allowing you to charge and use your iPhone, iPod touch or iPad. Spectral Smart Lights create gentle, atmospheric background illumination. The dimmable LED strips are installed out of sight. Your perfect permutation. Ameno, Cocoon, Scala und Next are carefully conceived collections that allow you to combine a wide variety of elements to create your very own, very personal furniture. They can be wall-mounted, floor-standing, or raised on feet. And there is a huge choice of colours, materials, depths, flaps, drawers, doors, top panels, closed and open wall units, on-top elements and shelves. Build your unique Spectral furniture configuration. Made-to-measure. Made-to-order. Literally. At Spectral, we manufacture your furniture to your specifications. For example, our state-of-the-art equipment at our smart factory allows us align the dimensions of Next elements with your walls, alcoves and audio-visual equipment. We can shave off as many millimetres as you want from the width of your Next cabinet, up to a maximum of 20 cm. And you can extend the depth to 60 cm. Spectral is always a good fit. Download the Ameno product portfolio in pdf format.